Trick or Treat?? No trick, just 100% treat with this seasonal favorite. 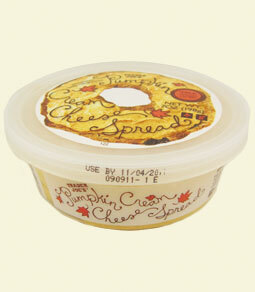 This cream cheese spread carries a creamy, pumpkiny taste that will leave your taste buds forever frozen in October. Maybe it is a trick? Either way, stock up today to keep the ghosts and gobblins away. Call me skinny pumpkin, but is it appropriate to dress as a giant bagel for Halloween in hopes of someone dressing as a giant Pumpkin Cream Cheese Spread?